By Ian Curran | October 10, 2017. 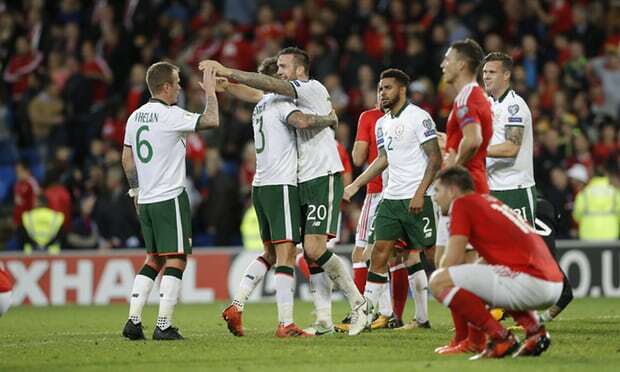 James McClean’s second half strike in Cardiff sends the Republic of Ireland into the World Cup play offs. Before the Moldova game last week, it was all doom and gloom as Ireland’s hopes of a place in Russia 2018 seemed unlikely. As the clock struck nine in Cardiff last night, James McClean struck gold with a right footed effort into the bottom corner and sent Irish football fans into euphoria. The first half was probably the most predictable of proceedings as both sides adopted a cagey and careful approach, with the pre-match rendition of Wales’ national anthem taking most of the social media attention. The highlight of the half was a fantastic save from Darren Randolph to keep out Robson-Kanu, as Ireland went in at half time with just 30% of the ball. 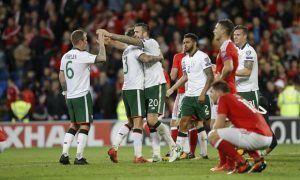 Wales lost Stoke’s Joe Allen to injury just before the break but it didn’t seem to affect their rhythm as they continued to pin Ireland back and control possession, but as the game approached the hour mark, that was all turned on its head. Jeff Hendrick reclaimed the ball on the right before crossing into the feet of Harry Arter, who brilliantly stepped over the ball for McClean to sweep it home past Wayne Hennessey. Liverpool’s young starlet Ben Woodburn became Chris Coleman’s trump card soon after, replacing Andy King. Jeff Hendrick and Harry Arter both pulled up with cramp, with the latter being replaced by Glenn Whelan. The final fifteen minutes were nervy as the stakes were so high, but in truth fairly comfortable. The World Cup play off draw takes place on the 17th October, with the games falling on 9/11th and 12/14th November. In terms of our possible opposition Italy and Croatia are the only certainties so far while we await tomorrow’s results.